ILAE GWAS. This is one of the rare occasions when I can write on behalf of the ILAE Genetics Commission and discuss a recent publication. Earlier this week, the ILAE Consortium on complex epilepsies came online in Lancet Neurology. This study is a large meta-analysis of almost 9,000 patients and 26,000 controls looking at common genetic variants predisposing to common epilepsies, including the Idiopathic/Genetic Generalized Epilepsies and focal epilepsies. In a nutshell, when looking for common variants predisposing to the epilepsies, the answer is surprisingly simple. Genome-wide association. Genome-wide association studies (GWAS) query the human genome for common genetic variants that predispose to disease. Common genetic variants are markers that are frequent in the general population, but are significantly more or less common in patients with disease. In most cases, the risk conferred by these variants is small – usually the risk is increased by a factor of 1.3 or less. In most cases, this increase in risk is insufficient for disease prediction and treatment decisions. However, in many disorders genome-wide association studies were the first possibility to catch a glimpse of the underlying genetic architecture without having a prior and possibly false hypothesis of what the contributing genes might be. In the epilepsies, GWAS have thus far been largely unsuccessful – and the ILAE Consortium GWAS may tell us why this is the case. GWAS in epilepsy. There have been hundreds of genetic association studies in epilepsy as catalogued on the epiGAD website. Many studies predate our current understanding of what it takes to call a genetic association credible – in brief, we need to be very, very sure that the finding is due to a true association and not a spurious findings. This has led to p-value thresholds that are unheard of in other fields of science. In contrast to the 0.05 significance level, we require a significance level of 5.0E-8, which is referred to a genome-wide significance. Even if we only test a single gene, we pretend that we do multiple tests for all genes in the human genome. And this is simply because we have been wrong so often in the past. Taking this new level of security into account, there are very few studies in the field of epilepsy that are technically capable of reaching this threshold. The ILAE Consortium GWAS now combines most of these studies through a meta-analysis. All epilepsy: there is evidence for SCN1A and for PCDH7, a gene that was not previously known to play a role in epilepsy. IGE/GGE: there is evidence for VRK/FANCL, a finding that is largely driven by the EPICURE IGE/GGE GWAS, which contributes the majority of the IGE/GGE patients in the current study. Focal epilepsy: no single gene passes the significance threshold. If we lower the significance thresholds, there are other genes popping up in addition including GABRA2 and GOLIM4 in all epilepsy and MMP8 in IGE/GGE. It should also be noted that in all associated regions the variant with the strongest association signal is either intronic, intergenic or synonymous. This raises concerns that assessing the functional changes caused by these variants will be straightforward to examine in model systems, a dilemma that is common to GWAS studies in many diseases. Three things to take away from the ILAE GWAS. These are the three key points that you should take away from the ILAE GWAS. First, all previous association studies in epilepsy need to be seen in the light of this new, comprehensive meta-analysis. The large meta-analysis has virtually evened out the discrepant results from all previous studies. 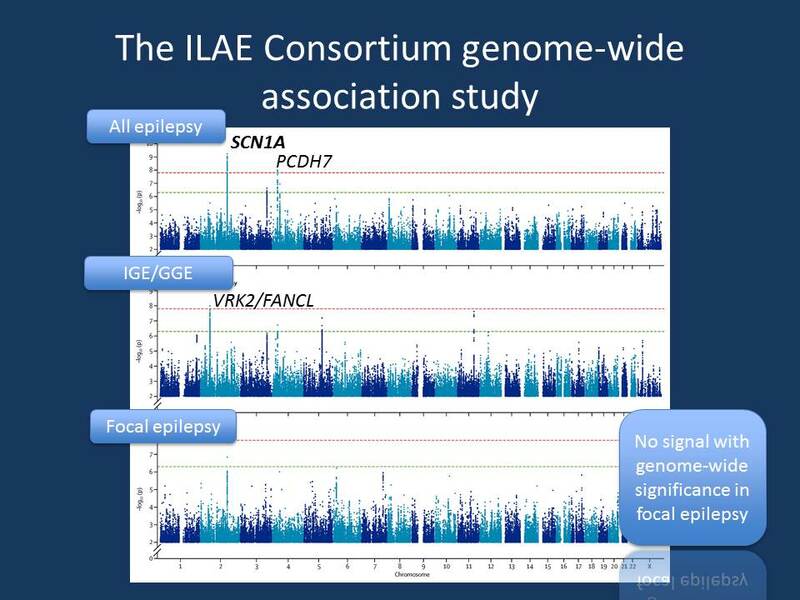 If a previously implicated gene is not significant in the ILAE Consortium GWAS, it will be very hard to explain at this point in time that common variants in this gene are associated with epilepsy. However, as shown in schizophrenia, there might be many common variants to be discovered once the sample size increases further. Second, the larger the samples, the more SCN1A you will find. There was some evidence for a role of common SCN1A variants in the EPICURE IGE/GGE GWAS and in a study of cases of hippocampal sclerosis with febrile seizures, but the current study is a strong reminder that a spectrum of common to rare variants in SCN1A may be associated with epilepsies. This indicates that we are on the right track at elucidating key mechanisms underlying seizure disorders if we focus on the role of SCN1A variants. Third, the current ILAE Consortium is a joint effort by many consortia from different continents and dozens of groups working in the field. We have managed to put all the data together and join smaller studies into a single, large project. Personally, I feel this is something that the epilepsy genetics community can be proud of and it sets the precedent for future large studies to come. This entry was posted in 2014, EuroEPINOMICS, Papers and tagged case-control study, GABRA1, GABRA2, genome-wide association study, GWAS, ILAE Consortium on Complex Epilepsies, ILAE Genetics Commission, International League Against Epilepsy, PCDH19, PCDH7, SCN1A, SCN2A, SCN9A. Bookmark the permalink.